Tokushima ramen proves a tradition need not be old to be worth celebrating. With a history dating back little more than fifteen years, Tokushima ramen exploded on the scene in 1999 and has taken Tokushima prefecture's noodle scene by storm. 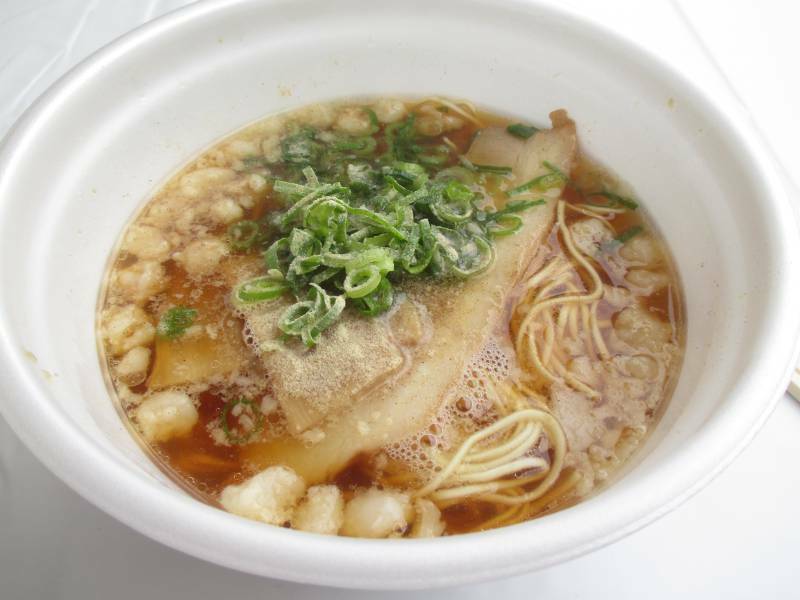 What defines Tokushima ramen? Of course, authentic Tokushima ramen has roots in Tokushima prefecture. More varied than Kagawa prefecture's famed sanuki udon, Tokushima ramen's characteristic dark, pork-based broth gives the soup a rich, hearty flavor. As opposed to run-of-the-mill hardboiled eggs, most Tokushima style ramen dishes feature raw egg with negi (spring onion) and bean sprouts. Bored of your average soba, undon and even ramen dishes? 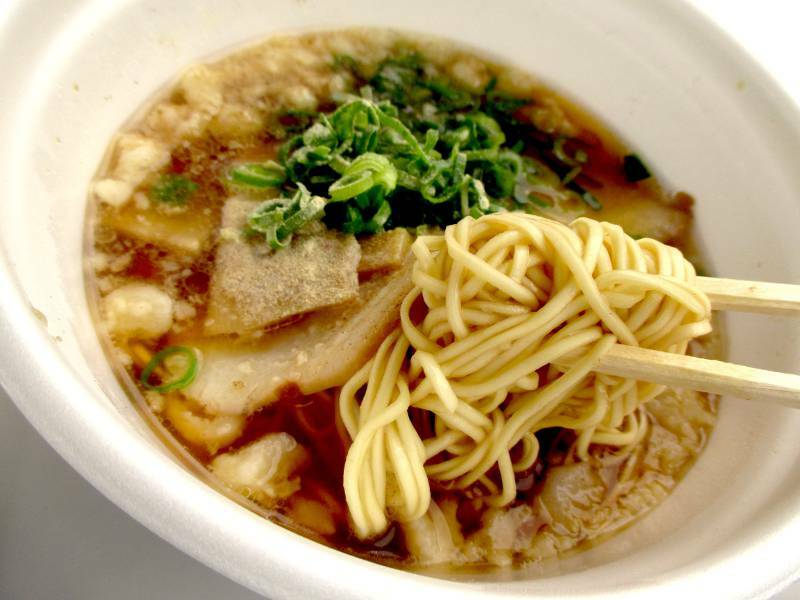 Let Tokushima ramen give your taste buds a punch! The ingredients make for a robust, captivating flavor. And it's even got its own festival. Let's dig in! 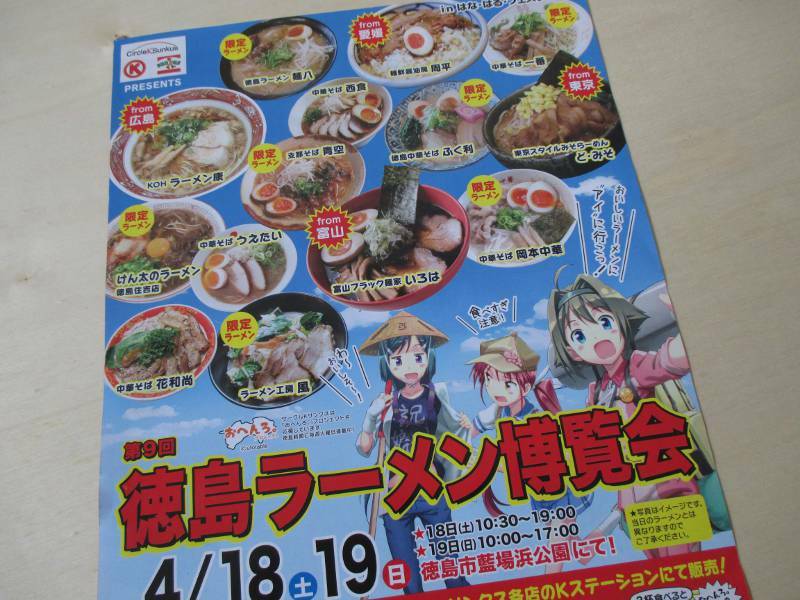 Convenience store chains Circle K and Sunkus sponsor the ramen festival, which is held mid to late April at Tokushima's Aibahamakoen 藍場浜公園（あいばはまあこうえん）, just a 3 minute walk from Tokushima Station. They say the early bird gets the worm – sometimes that "worm" is avoiding long lines. Other times it means being able to sit down while enjoying your ramen! 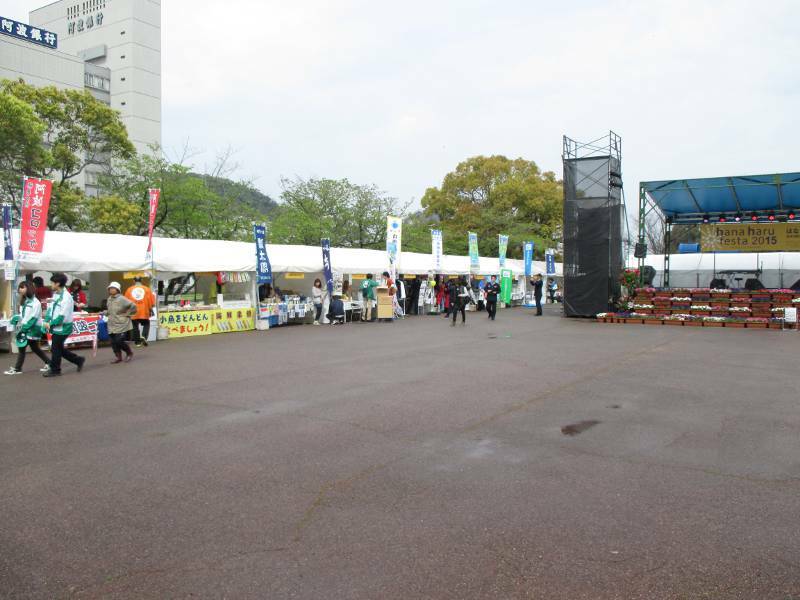 The Tokushima Ramen Festival starts at 10am. Skip breakfast and get there early to avoid long lines. 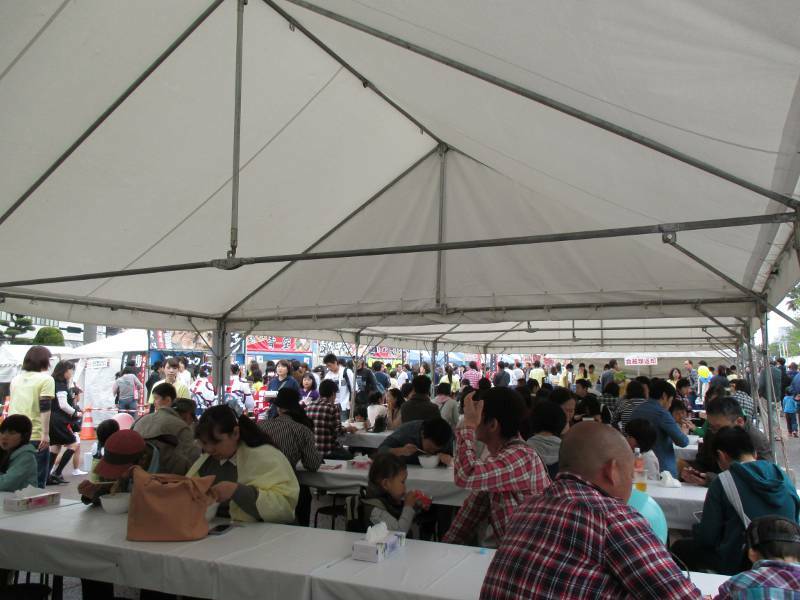 Visiting the festival at lunch or dinner time ensures the biggest crowds and longest wait. 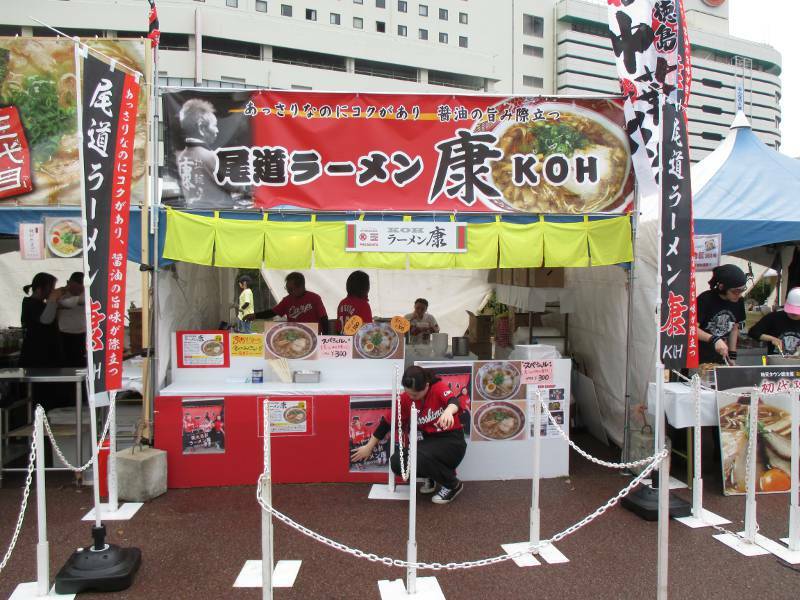 Hoping to taste the most popular ramen? You might have to wait an hour or more. 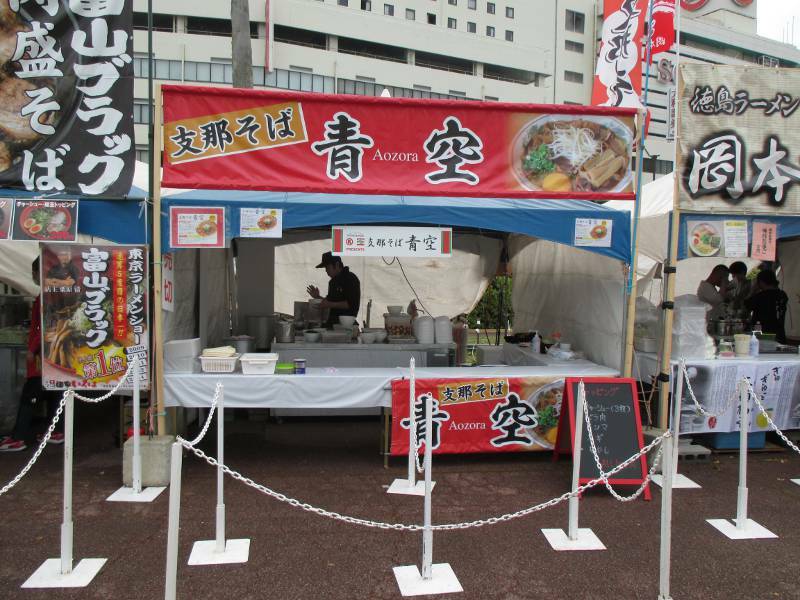 Each ramen shop sets up a small stand with all the ingredients to provide their authentic product. 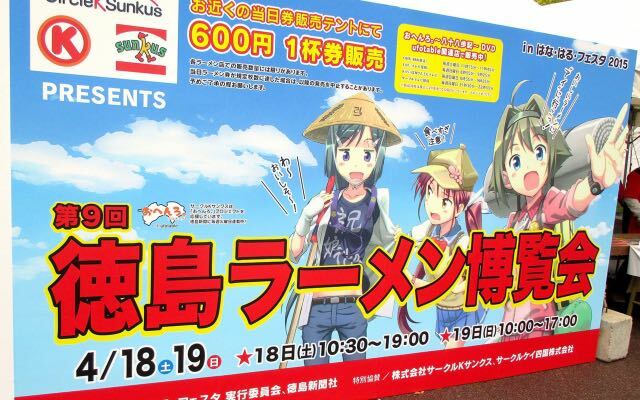 Sometimes shops create special, "limited edition" ramen for the festival. One shop squeezed fresh sudachi lime, a Tokushima specialty, over the broth. Although most shops hail from Tokushima, others come from far and wide. 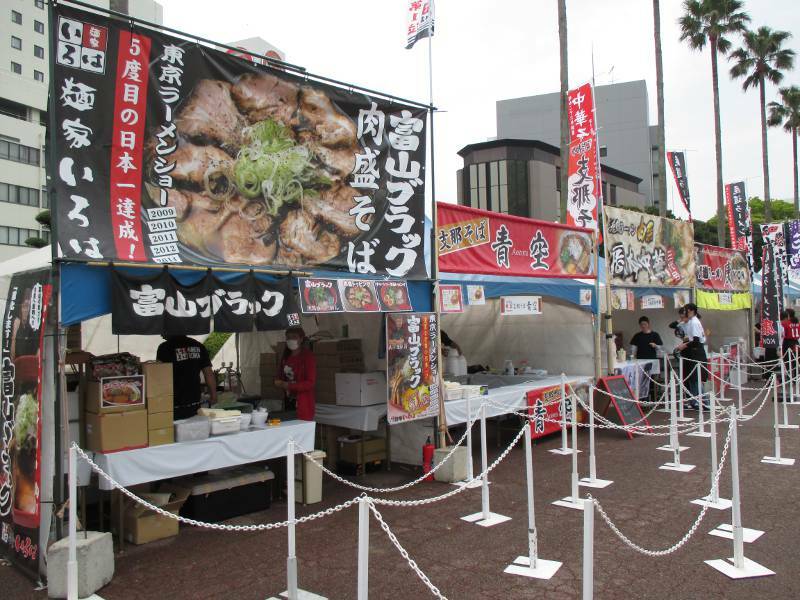 Shops from Hiroshima (Koh Ramen, pictured above), Tokyo, Ehime, and Toyama bring their distinct styles to the festival. 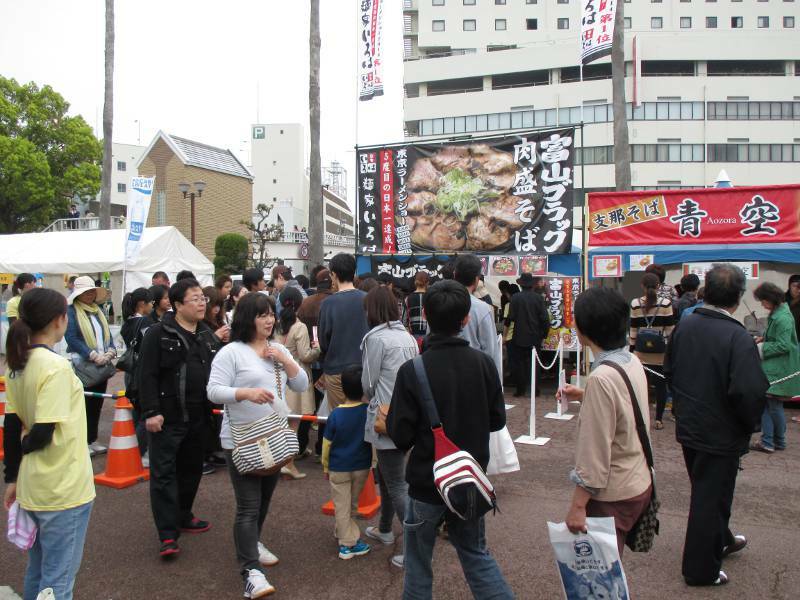 Since Tokushima residents can eat Tokushima ramen anytime, shops from other prefectures amass the biggest queues. 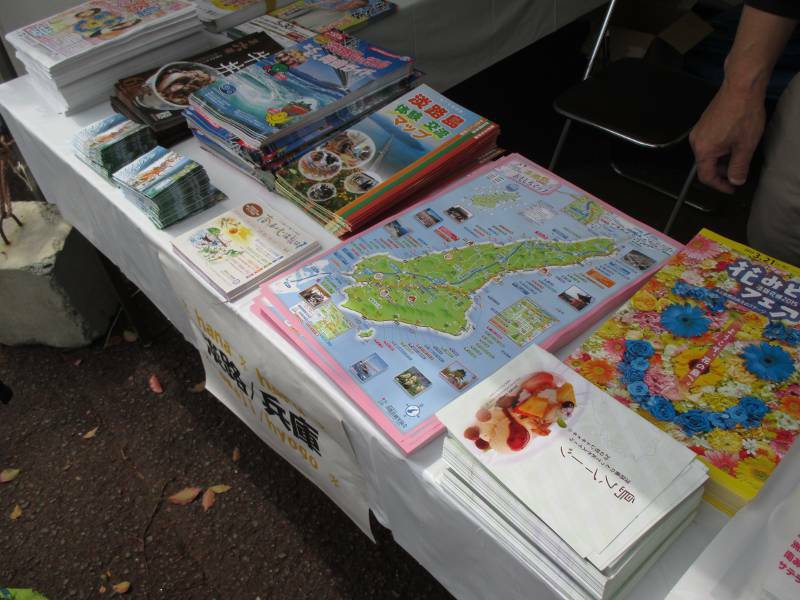 But the Tokushima based shops don't do too bad. By lunchtime ravenous ramen fans lineup at every shop! 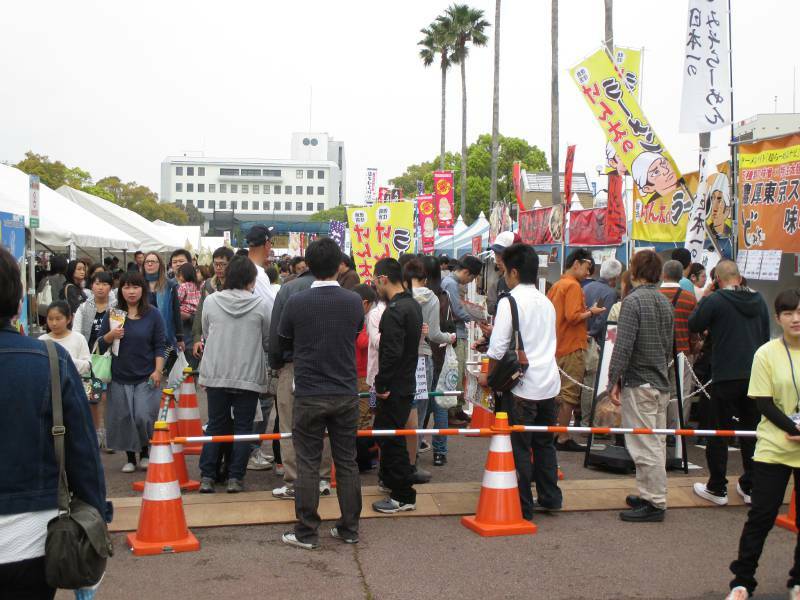 With fourteen types of ramen to choose from, festival-goers face tough decisions. 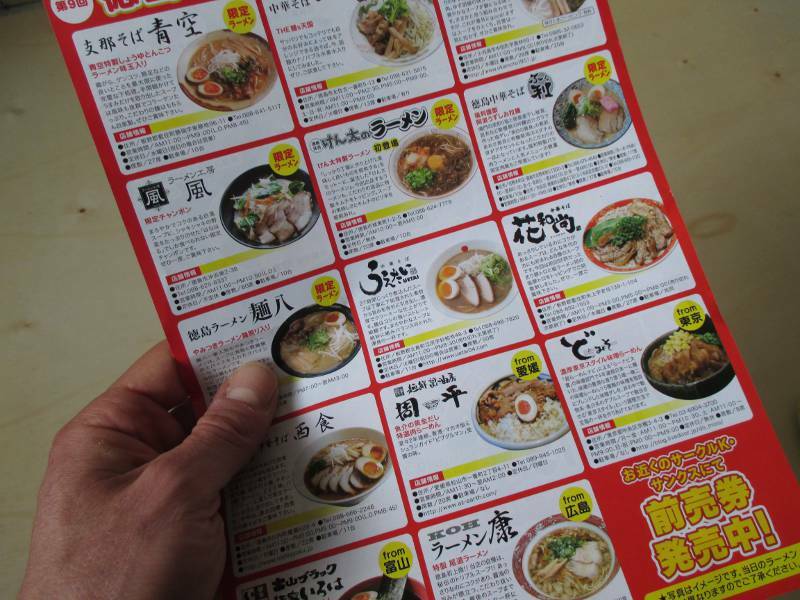 Ramen can be hard on both the wallet and the body (apparently Tokushima ranks as one of Japan's heavier prefectures). I devised a plan to try four different types of ramen, splitting each bowl with a friend. Here's what we ate. Do Miso from Tokyo offered a rich, garlicky miso-based broth garnished with corn, spring onion, dried seaweed and bean sprouts. I loved this shops thick, slightly al dente noodles! 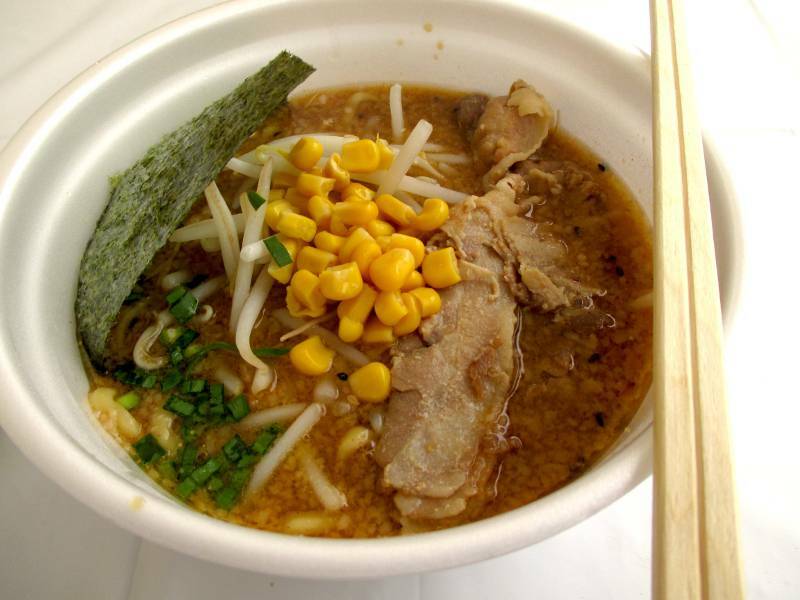 The broth's salty taste contrasted with the sweet corn to great effect. 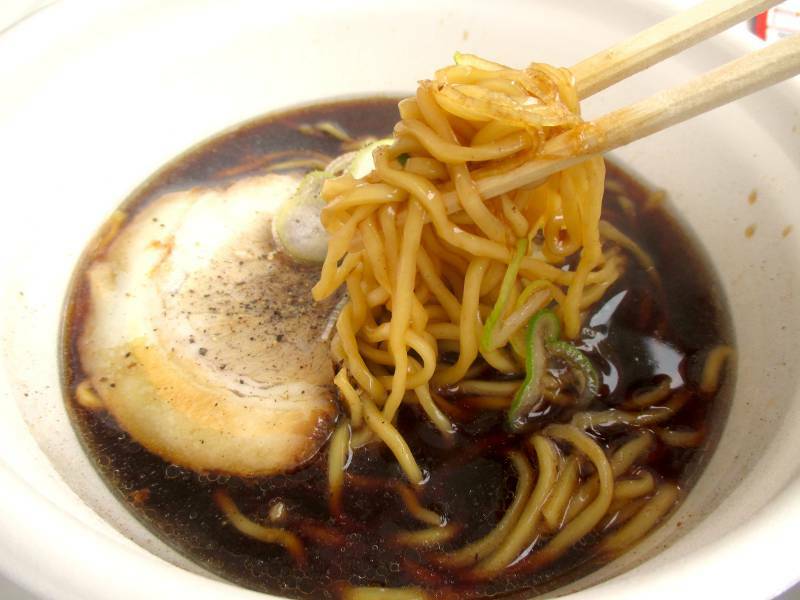 Between the noodles, broth and garnish, it's no wonder Do Miso's ramen is the most popular at the festival! Decked out in Hiroshima Carp red, Koh's cheerful workers created a Hiroshima-inspired atmosphere to complement the Hiroshima taste. 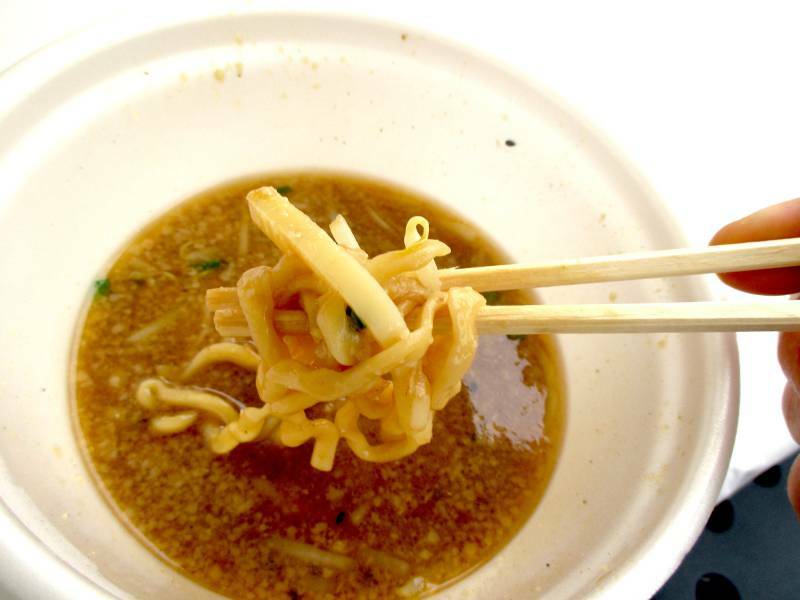 Koh's thin, long noodles matched its thin broth. The two seemed to melt in your mouth, a total contrast to Tokyo-based Domiso's ramen. Topped with negi and thin cut pork, Koh offered a light but delicious ramen. 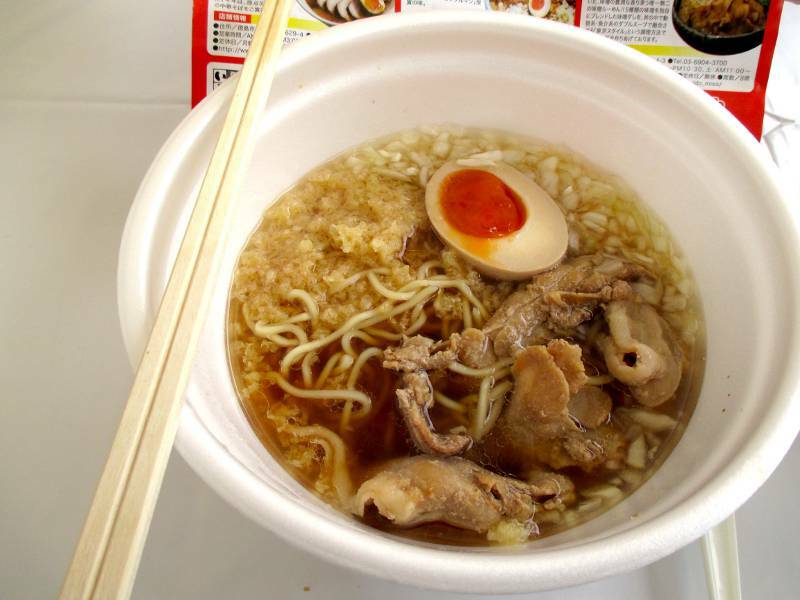 Compared to the other ramen dishes, Ehime's Shuuhei ramen had a simple appearance. But sometimes simple means delicious. Shuuhei's ingredients included noodles, meat, half an egg and pork fat, making it a surprisingly indulgent, rich ramen, worthy of the Tokushima Ramen Festival! 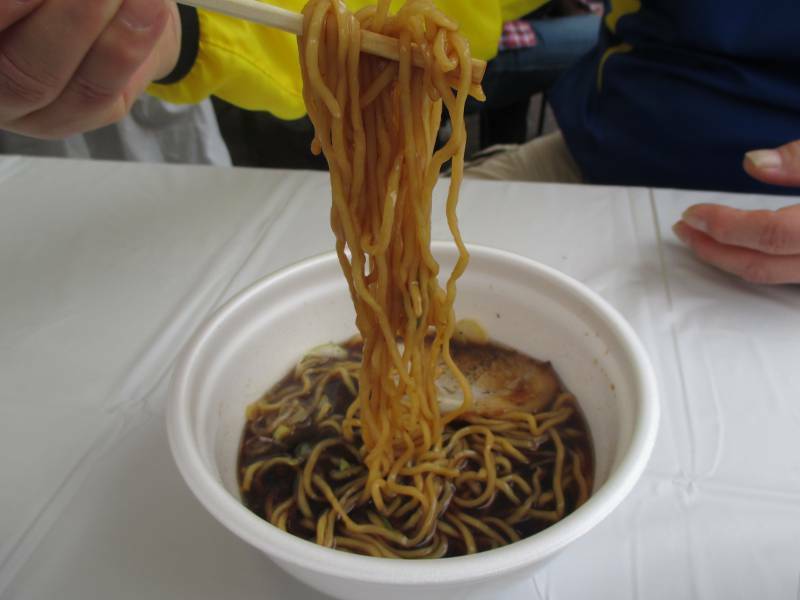 Toyama's ramen gained popularity for its black broth and attractive presentation. Toppings include classic fare: cuts of pork, a hard boiled egg, takenoko (bamboo sprouts), seaweed and negi. The rotund noodles held the broth and made slurping unnecessary. 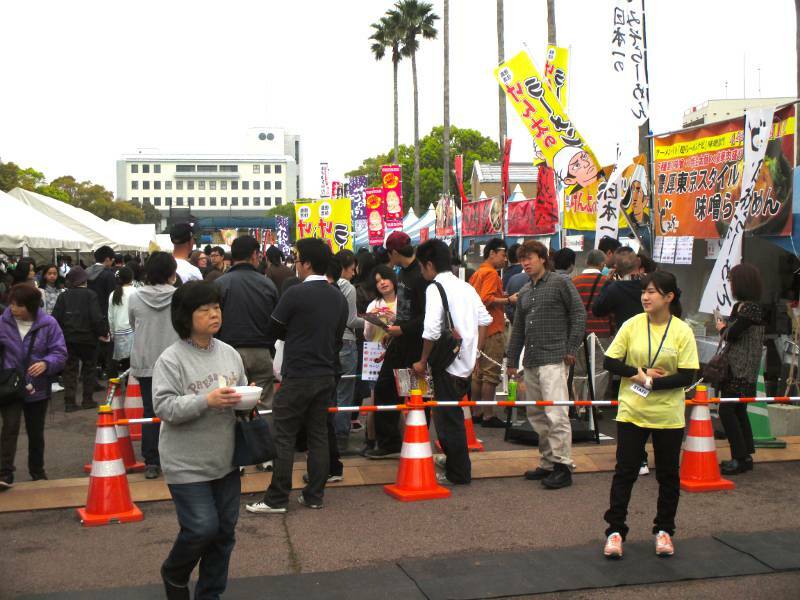 Every year Tokushima Ramen Festival proves that out of all of Japan's noodle dishes, ramen offers the widest variety of broth, toppings and noodles. Just look at the lineup. Each of the fourteen types of ramen vary enough for anyone, from ramen connoisseur to noodle novice, to appreciate. It's no wonder the festival has become so popular! 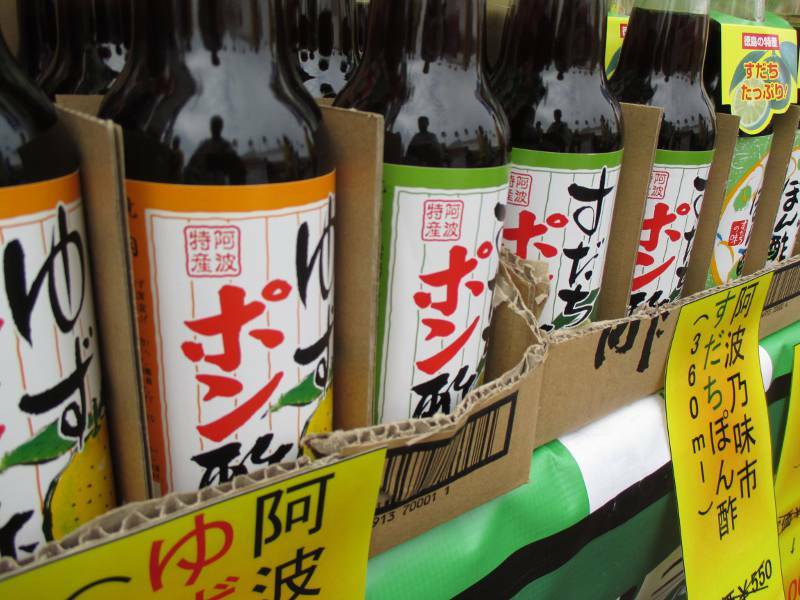 Like all Japanese prefectures, Tokushima takes pride in ALL of its local offerings. 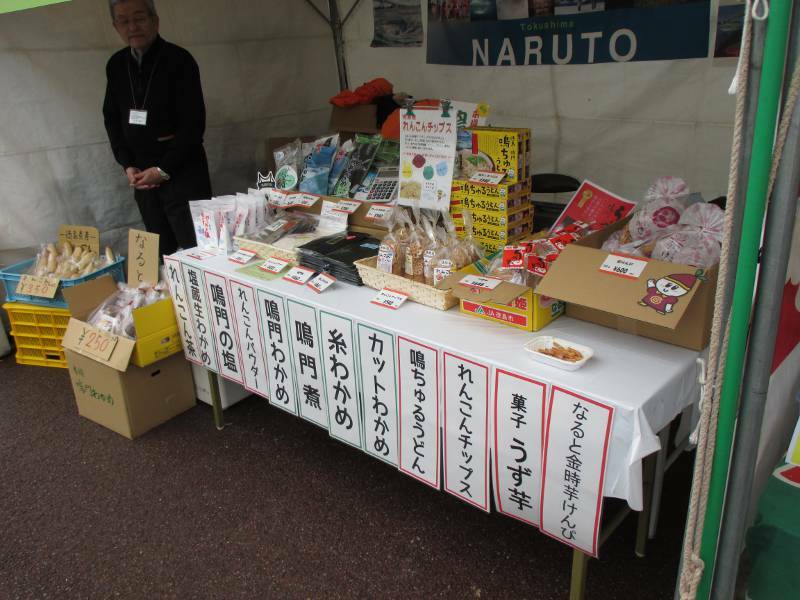 That includes the products of Otsuka Corporation which has one of its headquarters in Naruto, Tokushima. 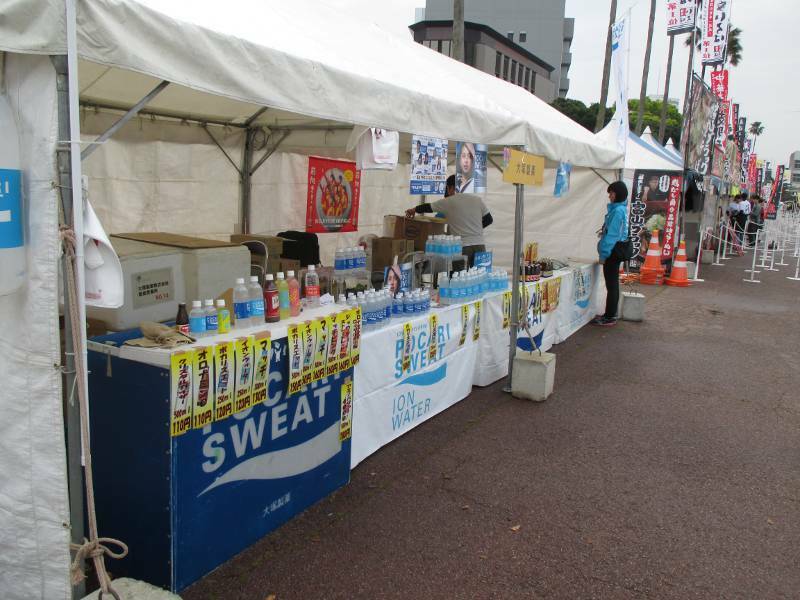 So when thirst strikes, buy a Pocari Sweat, Amino Value, or Match soda and support a local business. 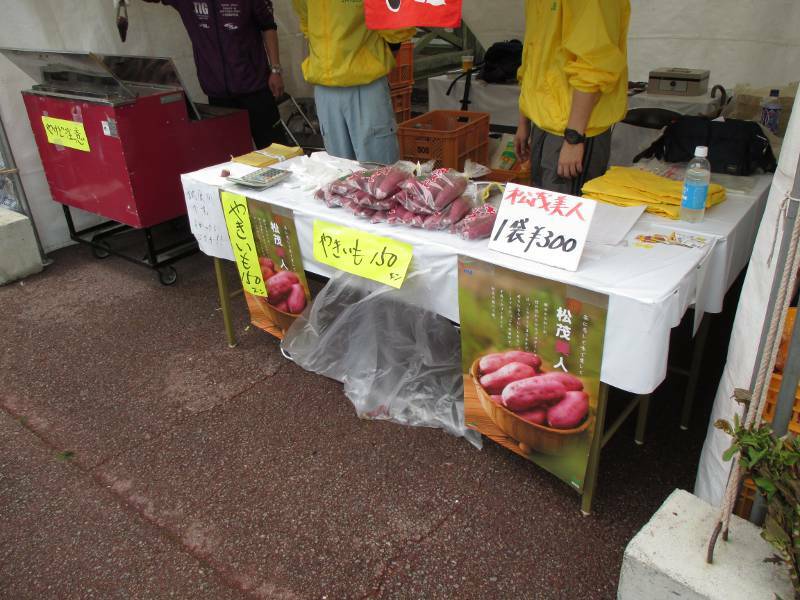 How about locally produced renkon (lotus root), wakame seaweed or Naruto kintoki (goldentime) sweet potatoes? Get a baked potato for 150 yen to eat at the festival or buy a bag for 300 yen and bake them at home! Japanese sweet potatoes are dry enough to hold and eat like a pretzel, have a natural sweet taste and are one of the lightest, healthiest food options at the event. 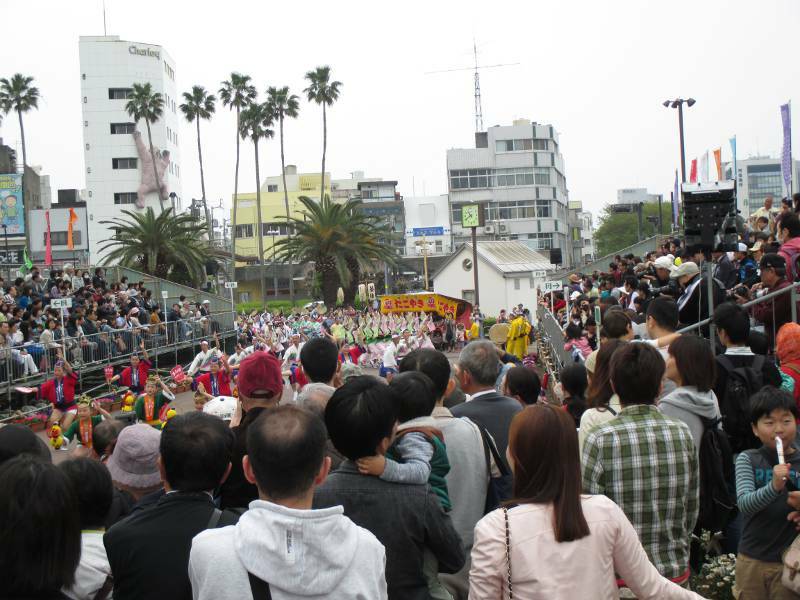 Tokushima couldn't throw a festival without celebrating its most famous meibutsu or local specialty, the sudachi! 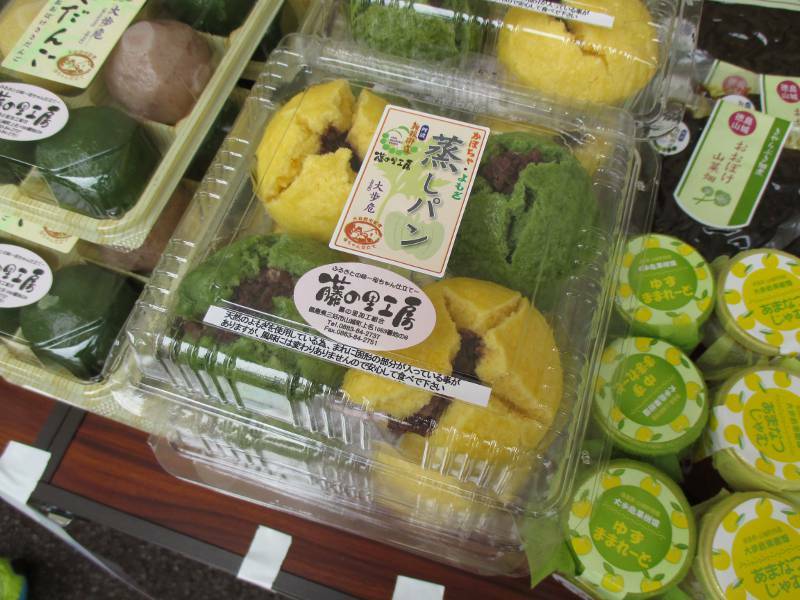 The small citrus looks like a mini-lime and is an expensive delicacy outside the prefecture's boarders. 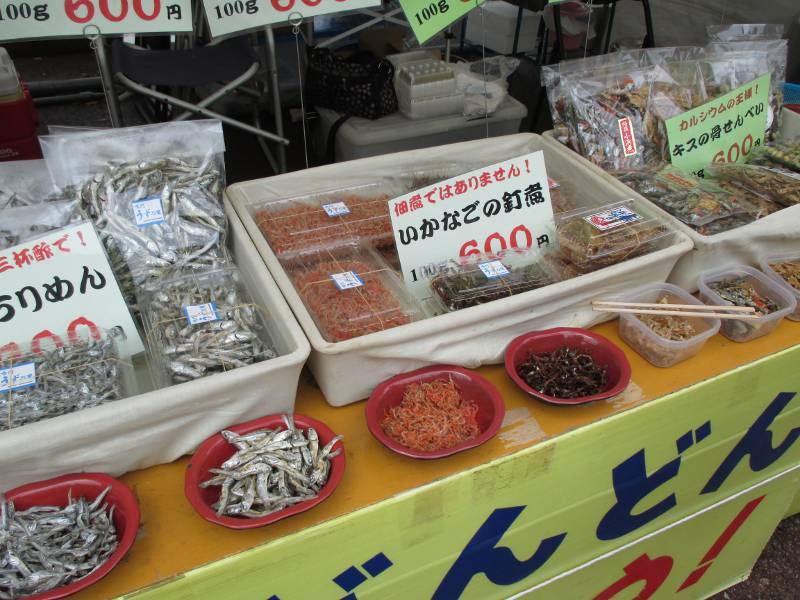 Customers with fishier aspirations can buy various types of dried fish. They go great with beer or as a snack while watching tv – or so I hear. 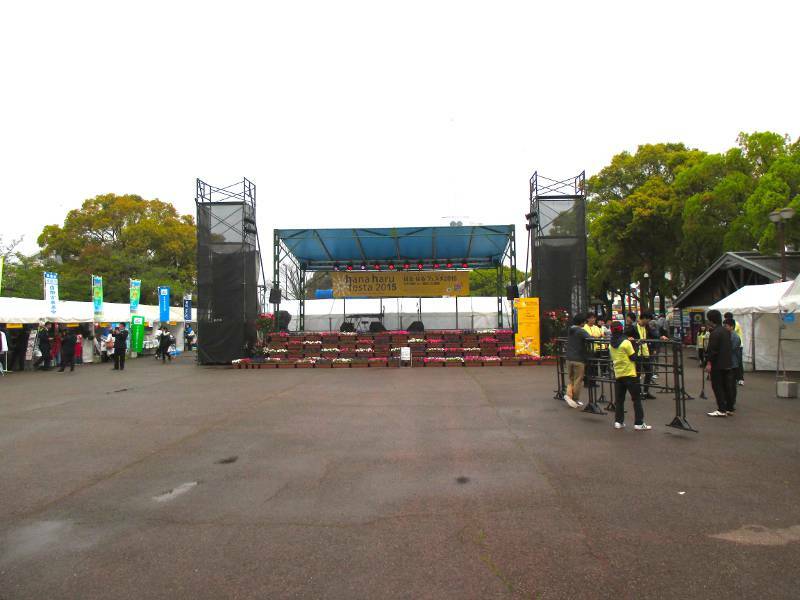 Once you eat your fill, visit the main (and only) stage at the park's west end for various performances including singing, dancing, rapping and rocking. Or venture to the opposite end of Aibahama Park (藍場浜公園) and take in some out-of-season Awa Odori, Tokushima's traditional dance.